I've just been reading up on an interesting approach to tackling the Getting Things Done (GTD) - it's called "Wrike" and it looks very intriguing. They say they will save you 30 minutes a day if you use their tools properly. Wrike is a web-based application, so you'll need internet access to use it, but that also means you can use it from anywhere. You get a simple "dashboard" to create and manage tasks, as well as reporting on future and completed tasks and projects. You can use tags and create heirarchical relationships to make it easier to group your activities. Of course, Wrike wasn't specifically written for Getting Things Done, but they've recently posted great guidelines for how to use Wrike for GTD. "Create a message with a task to one of your friends. 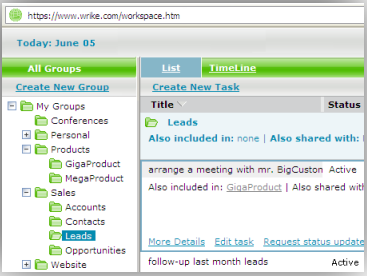 Put wrike@wrike.com in the CC field and add the due date [yyyy-mm-dd] in the subject line. The template due date is currently shown as tomorrow. Then hit the send button. Within next several minutes both of you will get an invitation from the system. You and your friend will be able to keep track of this task together. If the task is not marked completed by the due date, Wrike will remind both of you about it." According to their documentation, you don't need to be online to update and manage these tasks - you receive email notifications, and can update the rest of your team via email through Wrike. Hard to visualize? Click here to see a video demo of Wrike in action. They offer a free version and a Pro version ($5 per month) for individuals, as well as several flavors of team-oriented packages. For more info on pricing or to sign up, check out Wrike's pricing page. I haven't really used this yet, since I tend to be more of an "offline" or Outlook-centric kind of person for GTD, but would love to hear your stories if you decide to use it. The free version should make it a safe experiment for the curious and adventurous souls among you.